Whether as an announcement centre for the railway sector, as a control centre for industry or as an emergency call systems for tunnels, ProCom control centre technology ensures that there is a comprehensive overview of the entire communication system. This is where the various subsystems and functions related to PA, intercom and emergency call applications converge. Our user-friendly operating concept enables all sub-systems to be easy to control and monitor optimally. All important information is distributed to the respective points from the control centre. Therefore, our control centre system allows the communication system to be controlled automatically, semi-automatically or manually. Various levels of priority ensure that there is no friction in the process. The user-interface is an essential element of our control centre technology. All functions and messages of the control centre system converge here and are displayed in a well thought-out display. The user-interface displays the operational processes and is specifically adapted to the processes of our customers. 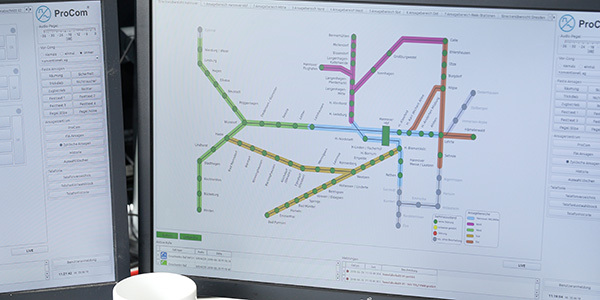 Our redundant control centre solutions as well as seamless monitoring of the communication system ensure high reliability, so that all important information arrives at its destination. We offer an optimal control centre solution – customised specifically to your individual requirements. Contact us to see how we can be of assistance!